How much does it cost to travel to Catalonia? How much money will you need in Catalonia? €122 ($137) is the average daily price for traveling in Catalonia. The average price of food for one day is €26 ($29). The average price of a hotel for a couple is €150 ($168). Additional pricing is in the table below. These average travel prices have been collected from other travelers to help you plan your own travel budget. Catalonia is a famous autonomous community in Spain. It is situated in the northeastern part of the country and consists of four provinces. The provinces consist of Barcelona, Girona, Lleida and Tarragona. Barcelona is not only the capital of Catalonia, but is also the biggest city in the region. Because Barcelona is such a large city and Catalonias long history of international trade, the area is a very popular tourist destination. Another reason for Catalonias success is its temperate climate. 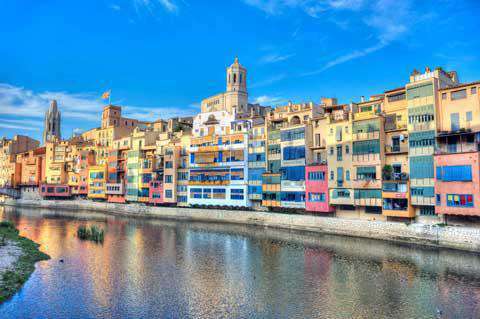 Two other reasons that make Catalonia different from other areas in Spain are, people speak Catalan, Spanish and Aranese, and its climate has both beaches and mountain ranges. There are many popular attractions in Catalonia that you can visit during your stay in Spain. If you are looking for beaches, one of the most popular ones is Costa Dorada, in the province of Tarragona. Another popular event in Tarragona is the annual human tower competition, where teams of over 100 people work together to make the largest human tower. If you are interested in historic architecture, you should meander on over to Girona, where you can tour the Jewish Quarter. Or if you enjoy mountainous regions, you should visit Lleida. One of the major attractions there is the old cathedral from the 12-15th century. Finally, if you are into city life, shopping, and incredible restaurants, Barcelona is for you! Not to mention its abundance of modernist architecture, specifically works by the famous Antoni Gaudi. What to eat in Catalonia? The cuisine found in this region is typically Mediterranean. It mostly consists of fresh vegetables, wheat products, cheese, poultry, lamb, a variety of fish and a heavy use of pork. It is common that much of Catalonias food includes both sweet and savory flavors, along with pork based stews and sauces. As far as finding you way around Catalonia, there are six different airports within this region. Therefore, it should be easy and reasonably cheap to fly between the different airports. Besides flying, the best form of transportation is by railway. The high speed rail (AVE) now runs between Madrid, Lleida, Tarragona and Barcelona. There are also a variety of other railways that travel all throughout Spain in addition to AVE. Finally Catalonia has a very effective public transportation system including the metro, buses and trams.